Hi, Everyone! Hope you are having a great day! This week is another nail polish of my MaxFactor collection. A few weeks ago I writed about the MaxFactor - 37 Prussian Blue . I really love that darker blue color. I've searched nearly everywhere but I couldn't find these Max Effect Mini Nail Polishes. I thought they sold out. Luckily I found them last week and I've felt in love with the color 27 - Cool Jade. 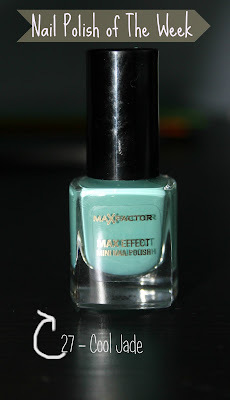 What I really like about the MaxFactor Mini Nail Polishes is that they really are usefull. The size is not too big for me that's why I can carry it easily in my bag when I'm travelling. The Max Effect Nail polish collection has many other beautiful colors that I want to buy. Do you own any MaxFactor nail polish? this is a lovely unique colour, looks great! all images are copyright to Catarina's Little Space unless otherwise stated. Simple theme. Powered by Blogger.